COMPETITION MOTORSPORTS has shown off their stunning Porsche 911 GT3R they will tackle the Liqui-Moly Bathurst 12 Hour with next month. The team has also confirmed that one of Australia’s most recognisable and premium brands Virgin Australia, has announced their partnership with the team for the race. 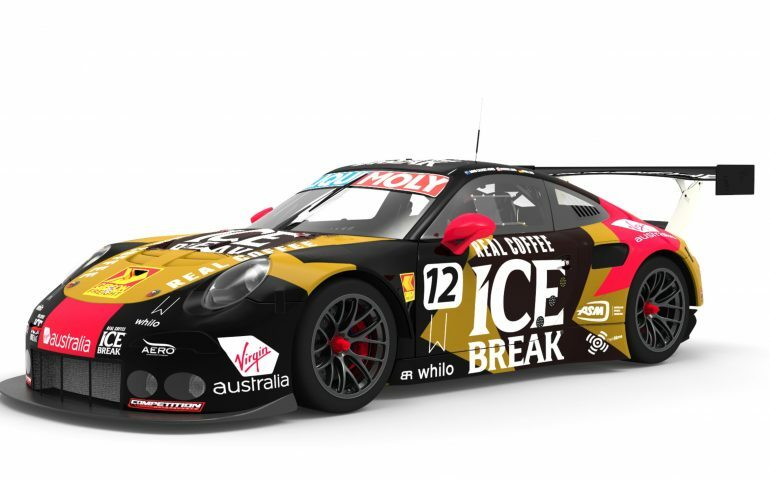 Virgin Australia joins major sponsor Ice Break Iced Coffee as a partner for the Porsche 911 GT3 R entry, who recently announced their line up to tackle the famous Mount Panorama circuit. Overall winner of the 2016 24 Hours of Le Mans Marc Lieb, three-time American Le Mans Series driver’s champion Patrick Long and David Calvert-Jones, who will be competing in his 4th Bathurst 12 hour, will combine their experience to tackle the mountain in the Pro/AM class of the event. LA based Australian driver David Calvert-Jones said he was excited about the prospect of having the support of such innovative and superior international brands for the event in early February. “Constant innovation is at the heart of everything Virgin Australia does and we see that as a perfect fit for Competition Motorsports and our Bathurst 12 Hour campaign. Virgin Australia has announced they will be chartering a flight on the Sunday of the event for 60 fans to cheer on the team. The flight departs on 5 February 2017 at 7.30am and will return the same day following the conclusion of the race at 9pm. Virgin Australia Holidays is offering three travel packages for fans, which include flights and transfers to the famous Mount Panorama racetrack. Competition Motorsports will be supported by Australian Porsche specialist team McElrea Racing and Porsche Motorsport North America (PMNA) and along with sponsor Ice Break Iced Coffee and Virgin Australia, will also have support from social media orientated gifting app Whilo and Los Angeles based racing simulator manufacturer CXC Simulations.